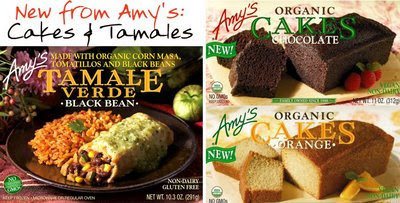 New from Amy's: Chocolate Cake and Tamale Verde! I used to live off of the brown rice, tofu and veggies frozen meal at work. And everyday before class at American U, I nibbled a warm Tofu Scramble breakfast pocket. And way back in the day, the tofu lasagna was my go-to meal before every high school babysitting job. NEW! I recently saw Amy's new Tamale Verde with Black Beans at Whole Foods and was very excited. Then I noticed from the Amy's website that they are also coming out with two new dessert products, cake: chocolate and orange. Nice. All vegan. My reviews ahead... I have not yet tried the cakes. Shelf-Appeal: It's in a box, and frozen. But the photo looks yummy, as usual. Label Check: 330 calories. 7 grams protein. 8 grams fiber. 1 gram sat. fat, 9 grams 'good' fat, 20% RDA iron. All good. However the 780 grams (33% RDA) sodium may not sit well with the low sodium crowd. Taste Test: Yum. Good flavor. Mellow spicy salsa Verde tones. Amazing tamale texture for a frozen food. Rice is heart and nothing is mushy. Price: Amy's says (SRP $4.29 - $4.99/10.3 oz) Not bad. Last Word: Another winner from Amy's frozen meals. Still shocked that I love a frozen meal. Great for an office lunch, but at family dinnertime, always try homemade.